“I think that’s just natural,” said Jesperi Kotkaniemi. He was describing a play he made in the third period of a 3-1 win for his Montreal Canadiens over the New Jersey Devils on Monday. It was no ordinary play. The puck came hard around the boards in the offensive zone and Kotkaniemi scooped it up, spun around and sent Charles Hudon in all alone on a breakaway with a blind backhand pass. It was the type of play a seasoned, playmaking centre makes; not one an 18-year-old kid playing in his first NHL exhibition game comes up with. Especially not a kid who said he had no idea what was going on in warmup. Nor a kid who said he had witnessed his first fight in a hockey game when linemate Nicolas Deslauriers tussled with Devils winger Brandon Baddock with less than five minutes to go in the first period. It took composure to pull that play off. 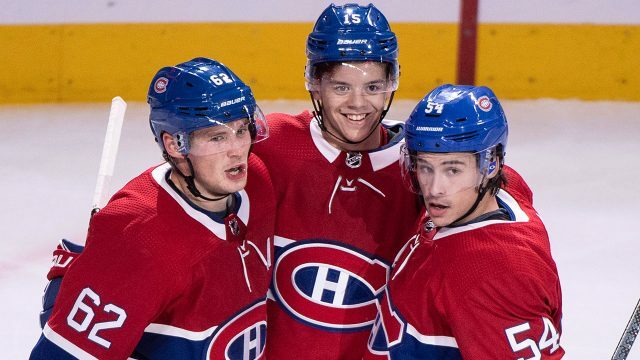 If there’s one thing Kotkaniemi would like to show the Canadiens brass as he makes the case to spend his season in Montreal, that’s it. The young Finn, who was drafted third overall just under four months ago, wasn’t just surviving in his eighth-ever game on North American ice; he was thriving. You could see him getting more and more comfortable with every passing shift, showing off his hockey sense, his tenacity on both sides of the puck, his speed and his playmaking ability. And then there was his shot. It was in the fifth minute of the third period that Canadiens defenceman Rinat Valiev stepped into a shot from the left-hand boards, which ricocheted off a Devils defender and found Kotkaniemi in the right circle. One-timer, snapper, rifled — a rising beauty of a shot that sifted over Devils goaltender Mackenzie Blackwood’s blocker and into the top corner of the net. The kid’s first shot of his first game gave him his first goal, and the crowd went absolutely berserk. A curtain call as the game’s third star was another highlight. But we learned more about Kotkaniemi on this night than a fancy pass and a beautiful goal could tell us about him. We learned the 6-foot-2, 187-pounder wasn’t afraid of the situation — or the players he was up against. When we checked the stat sheet after the game, we saw his average shift length was 49 seconds, which was a clear sign he wasn’t running scared off of the ice. We also learned Kotkaniemi could stand up to the physicality, like he did when 6-foot-2, 200-pound, bruising Devils defenceman Josh Jacobs threw a big-time hit at him. “If I were playing in juniors [last season], these guys might be like superheroes right now,” Kotkaniemi said. But the year he spent playing for the Assat in Finland, collecting 10 goals and 29 points in 57 games against the country’s best and strongest players, prepared him for this. The thing is, it had been a slow burn for Kotkaniemi in Montreal up until this point. He had stepped on the ice for the first time in a Canadiens uniform on Sept. 7, appearing completely out of his element in a 4-0 loss to Ottawa Senators rookies. Two days later he was back out there against Toronto Maple Leafs prospects, looking far more like the player fans who turned up to Place Bell in Laval expected to see, but he still appeared somewhat uncomfortable. But you could see the confidence building in Kotkaniemi when Canadiens on-ice sessions at main camp got underway last Friday. It was percolating during the team’s first scrimmage at the Bell Centre Sunday, and it boiled over on Monday. Now the idea is for him to keep it simmering. When Julien was asked earlier in the day about what Kotkaniemi needs to prove in order to stick with the Canadiens, the coach made it clear that the decision hinges on whether or not the kid can physically handle playing on a nightly basis against the strongest hockey players in the world. Only time will tell if Kotkaniemi’s up for that challenge, but he passed his first test with flying colours.